There are two types of projects – Public and Private. When you create a project, you can choose whether it’ll be Private (default option) or Public. Once you can create a project, you can always change its visibility by checking/unchecking the “Public(visible to the whole team)” checkbox. Only Admins can change visibility after a project is created. Admins can see and edit all projects and time entries, no matter if the project is public or private. People will automatically get access to the project once you add them (meaning, there’s no project invite). Once people are added to the project, they can select the project when tracking time. Only people who are invited to your workspace can be invited to a project. 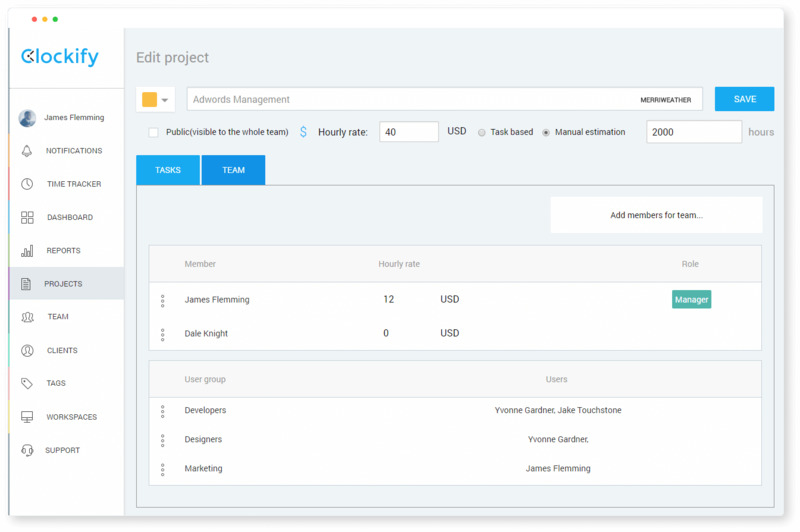 If you want to assign a different hourly rate for each person on some particular project, you can define it in that project’s Team section. The user who creates a project automatically gets the Manager role on that project. A project can have more than one manager. To give someone manager rights, go to project’s Team tab, click three dots next to the person’s name, and select Give manager rights. To revoke manager role, click three dots next to person’s name and select Revoke manager rights. Note: Admins can see and edit everything, at all times.